Enroll today and become a Holistic Nutrition Coach in 6 months or less! Become Certified in Holistic Nutrition and create lifestyle plans to support optimal health in 6 months or less! The Holistic Nutrition Certification program provides an unprecedented, evidence-based, professional training in holistic nutrition, whole foods and plant-based nutrition, which will provide you with a strong skill set and the confidence to coach and consult with any client seeking to not only prevent, but reverse disease and gain optimal health. Want to learn more about GMO's, organics, veganism, vegetarianism, whole foods, Paleo, dairy, non-dairy and how to achieve total wellness? This program is for you! As a Certified Holistic Nutritionist trained in natural complimentary nutrition, you will be able to coach, consult and advise clients on how to identify and help correct the nutritional causes of health complaints, and design personalized diet and lifestyle programs that optimize health. 100% Digital Access - Digital Access to digital versions of all course textbooks and online final exam. Textbooks Only - Print textbooks and online exam. Digital Access + Textbooks - Digital Access as noted above, plus a print version of each textbook and online exam. 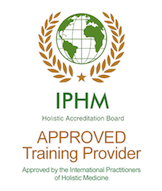 The Holistic Nutrition Certification program is internationally accredited and AFPA is an approved training provider by the International Practitioners of Holistic Medicine. The Holistic Nutritionist Certification program has been approved by NANP (National Association of Nutrition Professionals) for a total of 30 NANP Category 1 CEUs. AFPA is an approved school and continuing education provider by the CAIN Canadian Association for Integrative Nutrition and CHCA Canadian Health Coach Alliance. Graduates of AFPA approved certification programs are automatically approved to join C.A.I.N. or the C.H.C.A. with proof of graduation and will be awarded "Registered Holistic Nutrition Practitioner (R.H.N.P.) and / or the "Registered Health Coach" (R.H.C.) title. This course is valid for 1.9 NASM CEUs. AFPA is recognized by the National Academy of Sports Medicine as an Approved Continuing Education Provider. This course is valid for 15 AFAA CEUs. AFPA is recognized by the Athletics and Fitness Association of America as an Approved Continuing Education Provider. What is Holistic Nutrition? What is a Whole Foods Plant-Based Diet? What is a whole foods, plant-based diet? Put simply, it is a diet that prioritizes eating whole or unprocessed plant foods, minimizes meats, fish, dairy products, and eggs, and eliminates highly processed foods. This is not necessarily a vegetarian or vegan diet. When you design your diet of whole foods at or greater than 90 percent plant-based, that means you keep animal products meat, eggs, dairy, fish at no more than 10 percent of your total daily caloric intake. Did you know the American Institute for Cancer Research has established 10 recommendations for cancer prevention, beyond not using tobacco? The dietary message is: Diets that revolve around whole plant foods—vegetables, whole grains, fruits and beans—cut the risks of many cancers, as well as other diseases significantly. Did you know it is the position of the Academy of Nutrition and Dietetics that appropriately planned vegetarian (including vegan) diets are healthful, nutritionally adequate, and may provide health benefits in the prevention and treatment of certain diseases? Most Americans consume highly processed and refined foods that accelerate the rate of chronic diseases like diabetes, heart disease and cancer. Additionally, the obesity rate and type 2 diabetes in adults and children have become national epidemics primarily due to these refined and processed foods. It is estimated that an American born in 2000 has a one in three chance of developing diabetes in his or her lifetime, and the risk is even greater for a Hispanic American or African American. Furthermore, it is estimated that 80 percent of type 2 diabetes cases can be prevented by a change in diet and exercise. The problem lies in getting people to change the foods they eat. YOU can help change this! Processed foods and beverages have become so commonplace that people often don’t see them for what they truly are. They think these artificial food substances are actually real foods. YOU can help to educate them! This course provides you with the latest clinical studies, cutting-edge science and proven methods to empower your clients to achieve optimal health and take control of their own life, with your help! What is a Plant-Based Diet Certification? Counsel clients on basic rules of good holistic nutrition, healthy wholesome eating habits, and nutrition monitoring to improve their quality of life. Assess optimal nutritional needs; assess diet restrictions and current health plans; develop and implement nutritional plans and provide nutritional counseling. Advise on nutritional principles, food plans and diet modifications, and food selection and preparation. Organize, develop, analyze, test, and prepare optimal meal plans such as low-fat, low-cholesterol, plant based and chemical-free meals. Advise on habits for consciously eating healthy foods that promote vibrant physical and mental health while supporting a strong immune system and preventing disease. Holistic Nutrition Consultants may perform the above, in addition to advising patients on buying organic, taking supplements, and other nutritional considerations. Career Trends in Holistic Nutrition: Discusses the differences in scope of practice for Holistic Nutrition, Dieticians, Nutritionists and Health & Wellness Coaches. Offering Nutrition Advice: What You Can and Can't Do: Learn the specific guidelines, so you can focus on the areas where your insights and knowledge will truly make a difference. Graduates are advised to stay within the AFPA Nutrition Professional Scope of Practice. Holistic Nutrition Certification Program Guide: How the program is structured, key course topics and materials, testimonials and more. The Holistic Nutrition Science Module covers basic anatomy and physiology, describing each major system of the body and how they interrelate. Also presented are the models of health and disease, both traditional and holistic. You will discover which whole foods, herbs, and spices have been scientifically proven to prevent and reverse disease. You will also learn what to eat in order to help treat the top 15 causes of death, foods we should consume every day, and those that we need to avoid. Discussion of Pros and Cons of Various Diets: Low-Carb, Paleo, Etc. The Nutrition Counseling Skills Module provides you with a step-by-step guide to the fundamental skills of counseling strategies and protocol, complemented by action-based worksheets and practical case studies. Included are practical examples and first-person accounts of case studies that show how to execute various approaches, counseling strategies, and common nutritional assessments in a variety of settings. The worksheets and questionnaires teach students to document and assess counseling sessions. In addition, forms and checklists are provided for beginning practitioners. In the Holistic Health Research Presentations Module, you will hear the most current research to date, including practical advice on how best to feed ourselves and our families to prevent and even reverse chronic diseases. Note: Content listings for each presentation have been abbreviated. Do Vitamin C Supplements Prevent Colds? Is CAPB in SLS-Free Toothpaste Better? Comprehensive manuals and/or digital textbooks, online resources, video presentations, practice exam and online final exam. There are approximately 335 exam questions. You do not have to complete your exam in one sitting. It is the position of the Academy of Nutrition and Dietetics that appropriately planned vegetarian, including vegan, diets are healthful, nutritionally adequate, and may provide health benefits in the prevention and treatment of certain diseases. These diets are appropriate for all stages of the life cycle, including pregnancy, lactation, infancy, childhood, adolescence, older adulthood, and for athletes. Plant-based diets are more environmentally sustainable than diets rich in animal products because they use fewer natural resources and are associated with much less environmental damage. Full Position Paper.